The new Space Coast Transportation Planning Organization website included a dynamic color scheme, visually appealing elements representing East Central Florida’s Space Coast, integrated document sharing and much more. Southern Pine Lumber Company is Florida’s largest supplier of Pressure Treated Lumber, Timber & Piling and currently has 7 convenient locations throughout the State of Florida. eWareness is the nation’s leading Web-Centric solutions provider focusing on Web-Centric Marketing with a heavy emphasis on Web-Centric Technology and Web-Centric Design. Here are some of the types of businesses we work with:: B2B: Technology Companies, Engineering Firms, Aerospace, Manufacturing, Commercial Contractors. B2C: Restaurants, Processional Service Providers, Resorts, Brick and Mortar Retail Stores, Online Retails Stores, Gyms and Health Clubs, Healthcare Providers, Urgent Care Clinics, Spas, Bars and Night Clubs, Real Estate Offices, Wholesale Clubs. B2G: Federal Agencies, County Agencies, City Agencies, Local Agencies, Schools and Universities, Main Contractors, Sub Contractors, Veteran Owned Businesses (VOB/VOSB) and Service Disabled Veteran Owned Businesses (SDVOSBs/DVBE). Nonprofits: Homeless Shelters, Pet Food Pantries, Health Care Programs, Home Owners Associations, Churches and Religious Organizations, Veterans Organizations and Groups, Armed Forces Posts and Organizations, (VFW, DAV, American Legion, AMVETS), Social and Recreational Clubs, Business Leagues, Chambers of Commerce, Fraternal Beneficiary Societies and Associations and Voluntary Employees Beneficiary Associations. Give us a call today at 321-821-7483 to find out how Web Design Melbourne Florida (eWareness) can help you grow your business, often at a considerable savings over your current budget. 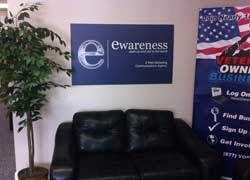 Whether you’re a start-up with just an idea or a large business with franchised locations all around the world, eWareness can help. Incorporated in 2002, we are headquartered right here on Central Florida's Space Coast in Historic Downtown Melbourne. We specialize in web-centric marketing with a heavy emphasis on web-based technology (CMS) & design. We work closely with clients of various sizes and industries. Customer Service is at the foundation of our company!